BEST SELLER | Upstage by Raquel Welch is the layered bob, perfected. It’s defined by innovation, versatility and classic elegance. This sophisticated hairstyle features a 100% hand-tied monofilament cap almost to the nape and handtied wefts at the nape, and ready-to-wear lace front.These features create supremely natural comfort and movement, a natural looking hairline and the appearance of natural hair growth. 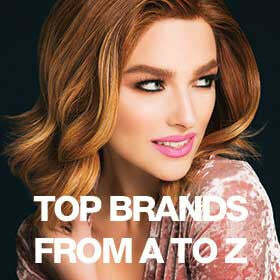 And Tru2life heat-friendly synthetic fiber allows you to use heat tools to create a flawless look. Also available in grey colors. Upstage has been a best-selling customer favorite for years. Watch our Upstage video and read customer wig reviews below!